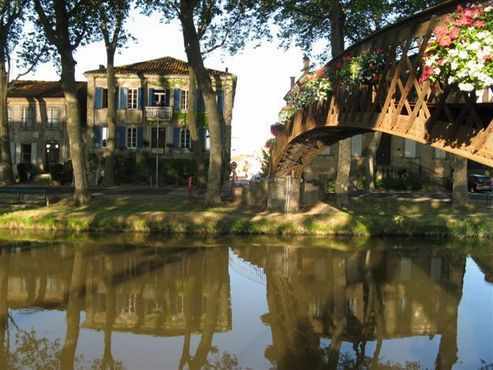 A lovely old town house, situated in the pretty canalside village of Sallèles d'Aude, within easy reach of the wonderful walled city of Carcassonne and the Cathar Castles, the Mediterranean, situated roughly half-way between the Millau viaduct and Spain. Five large, airy en-suite rooms (doubles & twin), with a generous continental buffet breakfast and home-cooked evening meals with local wines (book ahead). Guests have use of the TV lounge/sitting room, with a shady terrace at the front of the house overlooking the canal, with cold beers ready in the fridge! This traditional vineyard village has a bar, a couple of restaurants, a good selection of small shops, petrol station, Post Office and ATM. Take a ride over the Millau viaduct, visit the country of Andorra, visit the Canal du Midi classified as an historic monument by UNESCO and head to the lovely resorts and beaches of the Mediterranean just under half an hour's ride from the house. Your hosts, Greg (a Biker himself), Nick and Isobel, originally from the UK welcome you. Listed in Lonely Planet and the Rough Guide. Free Wi-Fi. Drying room and Motorcycle washing facilities. Extensive secure parking available in the enormous garage. where: 43 quai d'Alsace, 11590 Sallèles d'Aude, Languedoc-Roussillon, France.